Being a police officer, deputy sheriff or state trooper is often a thankless job performed under frequently dangerous and trying circumstances. Long shifts that change from days, to swing, to graveyard and back again take their toll; not to mention the mediocre pay and missed holidays and celebrations with family and friends. Yet our nation’s law enforcement officers continue to tirelessly serve their fellow citizens and provide the “thin blue line” that holds evil at bay and allows us to live in peace and prosperity. Cold Steel is pleased to give these real American Heroes a knife named in their honor and expressly designed to serve them “The American Lawman”. Built like a proverbial tank, it’s comfortable in the most extreme environments and will shrug off the harshest abuse like water off a duck’s back. 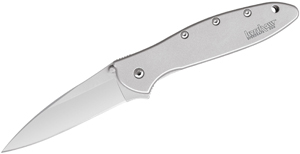 This is one super tough knife that can be relied on, even in life or death situations. The drop point blade is “civilian friendly” in appearance yet big, wide and most importantly, pointed enough for any cutting or piercing task. Made from Japanese AUS 8A stainless steel and hollow ground to a thin, hand-polished edge, it’s as sharp as a serpent’s tooth and will easily sever the toughest, most fibrous materials. To further protect it from rust and the constant exposure to inclement weather, it comes with a black, non-reflective Teflon® finish. Since law enforcement officers never really know what is in store for them from one shift to the next, we thought it was very important to make the “American Lawman” handle as versatile and user friendly as possible. Supplied with dual pocket clips and twin thumb studs, it’s completely ambidextrous and can be opened one-handed in a flash. Plus, due to its well thought out finger grooves, it’s equally comfortable and effective in either a forward or reverse grip and can be even “choked up on ” for tasks requiring extra fine edge or point control. Keeping a firm grip on their knife when their hands are cold, wet, tired or oily is also a major priority for law enforcement officers. 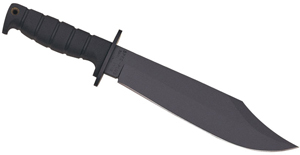 That’s why we have made the American Lawman handle with heat-treated steel liners (for extra strength and stiffness) overlaid with black, aggressively textured G-10 handle scales. 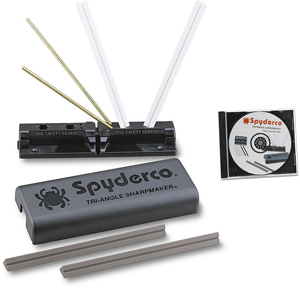 We believe this construction method is ideal as it’s lightweight, enormously strong and most importantly offers terrific traction to the hand so the skin and flesh of the fingers stick to it like glue. Having the lock break on your folder is serious and may result in badly cut fingers. But if the lock fails on a police officer’s knife, it could be a genuine disaster and result in loss of life or limb. That’s why we have provided each American Lawman with our Tri-Ad locking mechanism. Designed to withstand terrific impact forces and weight loads transferred to it’s mechanism from the edge, point and even back of the blade, it has passed with flying colors and never failed even once despite being subjected to the most gruesome torture testing scenarios we could devise.